A soldier asks, at one of the security checks before entering the mosque. Every city, every village, every street and street corner has its own character. It is that character, the fabric of the place that envelopes the air you breathe, the smells you smell, what you see hear and feel. It is that character that stays with you as details begin to fade with time. NAJAF IRAQ : Banners depicting Shia imams hang in a closed shopping area in commemoration of month of Muharram. Hundreds of Shia pilgrims were killed in Baghdad, Ramadi, and Kirkuk this morning. But what was the final destinations for those pilgrims? They were headed to Najaf and Karbala. The names of these two Iraqi cities get lost among the strife of sectarian violence documented on the BBC and in Al-Jazeera. I had the fortune of travelling to both holy places. I admit, I had my reservations in the weeks before leaving. I love to travel and see unexplored lands—my dream job is to be a wartime photographer for National Geographic. But a series of sectarian bomb blasts in Baghdad that happened the day we left, caused me to have second, third, and fourth thoughts–what were we embarking upon? 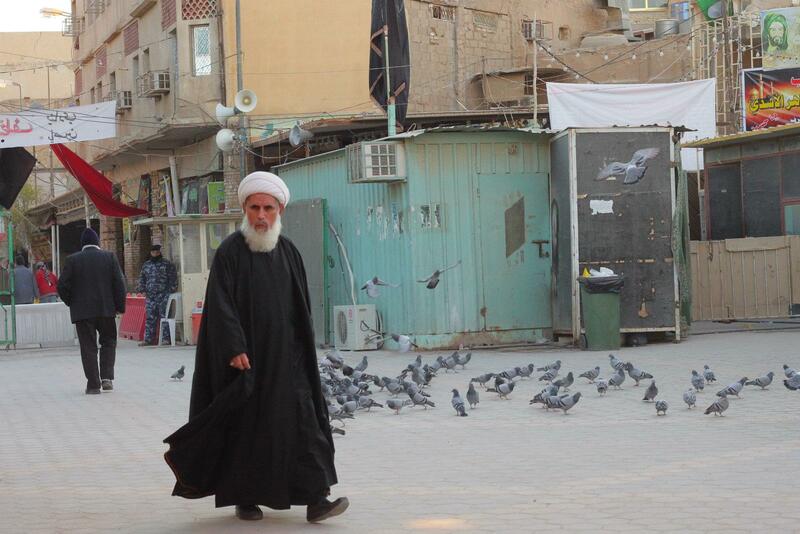 NAJAF IRAQ : A Shia cleric wanders the streets wearing traditional religious attire. Najaf is home to one of largest and oldest Shia seminary systems in the region. Shi’ism is peculiar because we are the minority. Although there really isn’t much of a difference on the surface, one does feel it if you are it. Your religious holidays are almost always a day later or earlier than the rest of the Muslim world due to a difference in lunar calendar, you raise your hands in prostration before you lower yourself to your knees during daily prayer, while the rest of the people around you go straight down. The most important difference, however, is what is at the heart of the sect—to summarize centuries of political factionalism and ideological conflict, Shia’s follow and remember the history of Islam as guided by the direct descendants of the Prophet Muhammad (pbuh) and his Holy Family. The tragedy of Karbala solidifies Shia identity. The Prophet’s grandson, Imam Hussain and 72 of his devoted followers and family members became martyrs in the Battle of Karbala against Yazid (the caliph–ruler of islamic domains of that time). This battle is at the heart of Shia belief, and it is the memory of this battle that drives thousands of people to Iraq every month of every year, despite the risk. The exploitation of these differences (majority and minority) are at the heart of the sectarian violence in Iraq and the region today. 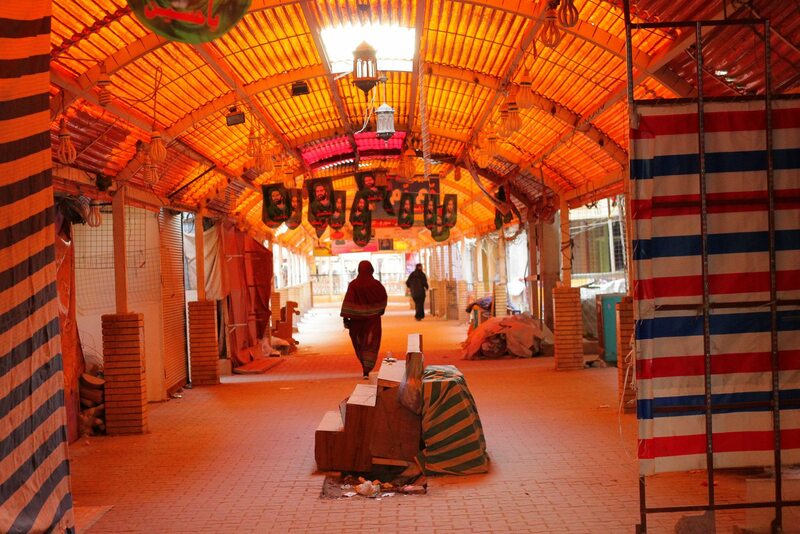 NAJAF IRAQ : The bazars are filled with shops selling religious garb, paraphernalia and trinkets. Walking through the streets of Najaf and Karbala, it is surprisingly easy to forget that Iraq is a war-torn country. 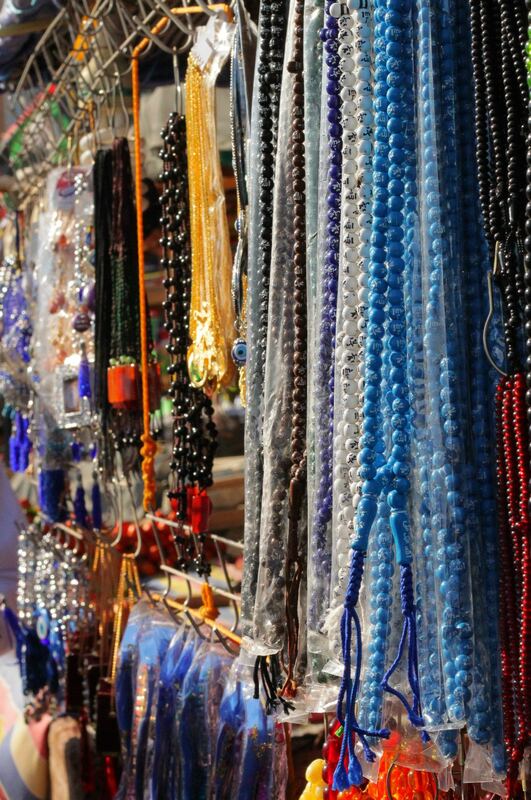 There are trains of colorful stands from which shopkeepers peek out to pester foreigners to buy hijabs, dates, and all sorts of religious paraphernalia. Elderly Iraqi men shop for oversized tweed coats and try them on in front of their circle of friends and laugh at each other, not knowing that a girl from thousands of miles away standing in the corner captured the entire fashion. There are fruit and vegetable markets, butcher stands and sugarcane stalls. But as soon as you step off the main road, the noise retreats, the light dims, and the shattered fragments of what once were buildings become reality. 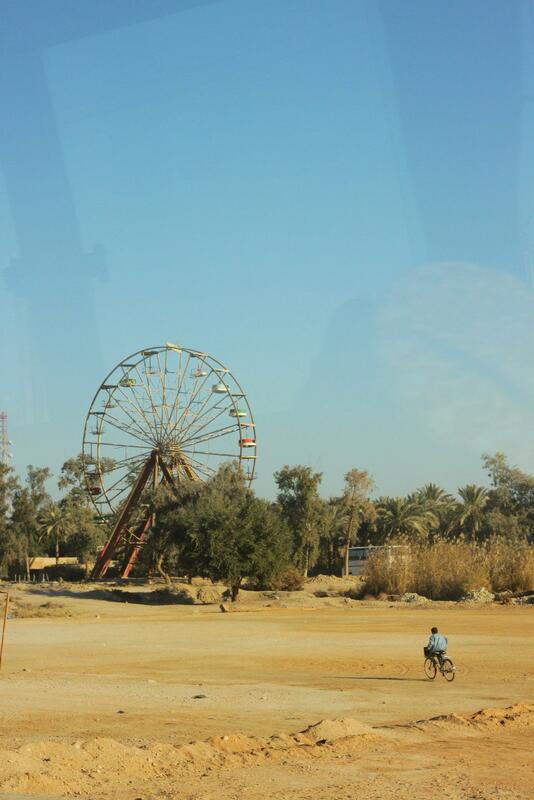 An abandoned amusement park lies just outside Najaf on the way to Karbala: Acres of cream-colored dust and a Ferris Wheel with no takers. NAJAF IRAQ : A Iraqi boy rides his bicycle in an abandoned playground. A Ferris Wheel feels the corrosive effects of the desert climate. If you sat in the mosque courtyard for a period of two hours, at least 8 jannaza’s—funerals—would pass through: a group of solemn men chanting softly “Surely we belong to God and to Him we return,” carrying the wooden coffin through the courtyard, into the zari area, and a few minutes later—back out into the streets. The city is lively, but not with celebration. It is draped in spirit, faith and flags. The people are poor, but they are honest. A man in our group dropped a wad of dinars on the road and a black-haired, black-eyed teenage boy came running after us minutes later to return it. Near the mosque entrance, a row of preschool age boys squats over weigh scales. Not particularly wanting to step on, I offered a kid with strangely auburn hair, earmuffs, and a Mickey Mouse shirt some coins that I had in my pocket. He wouldn’t accept them until I reluctantly agreed to reveal my mass in kilograms. There was a woman with two handsome twins dressed in suits walking next to us one afternoon on the way to the mosque in Najaf. Feeling bold, I asked her where she was from and how old her children were. She had lived in Najaf all her life, and the son whose shoulder upon which her left hand was resting was eight—his forehead still host to a bandage from a bomb blast a few months back. I asked if I could photograph her sons. In Najaf, we stayed in a small hotel that was a 5 minute walk on the main street from the Imam Ali mosque. Originally built by Persian rulers in the 10th century and remodeled by the Safavids in the 1500s, it houses the zari (grave site) of Imam Ali, the cousin and son-in-law of the Prophet, and after whose caliphate the Sunni-Shia split came into being. An immense golden dome presides over the center and the interior is inlaid with mosaic patterns of turquoise and lapis lazuli, white marble and gold. Inside the prayer and zari area—everything is made of glass. People were always there. There were groups at every time of the day stretched out on magnificent Persian carpeting. People from everywhere reciting prayers in their own languages, reading from the Quran, and mourning for Imam Hussain and Imam Ali with their own unique cadence and style. Our group from Boston would be chanting and reciting loudly, women and men together, led by our sheikh. A few minutes would pass and other pilgrims walking by would stop to circle around our group, softly hitting their chests in rhythm with us, many crying along with us. Once we finished, there would be a few other groups, perhaps from Turkey, Iran, or Lebanon, just arriving to begin their rituals for the night. I stood for hours listening to a plethora of prayers in languages I did not understand but could pick out the names that everyone knew. The religious spirituality of this place, and the Shi’ite spirit itself brought all these people together, transcending cultural, ethnic, and social boundaries. People were only focused on one thing and that was the place itself and the value and the importance that they gave to it and have been giving to it for hundreds of years. In the zari room itself there were huge crowds. In the women’s section, which regrettably was half the size of the space allotted for the men, everyone was grabbing each other, fighting to get a chance to touch the grave enclosure. Hundreds of women squirming just to touch the holy site. I endured a few jabs to the ribs myself. The overseers are really just there to bat the masses with feather dusters, aimlessly shouting “Move, move!” every thirty seconds. An elderly woman had tied herself to the grating with a green cloth, and was stretched out on the carpet, sobbing. A frail Afghani mother with a baby that looked even worse off than she tugged on my sleeve and pleaded with me if I would take her child into the throbbing masses and touch his head to the grating. He had been sick for two weeks and she said this was his last chance. 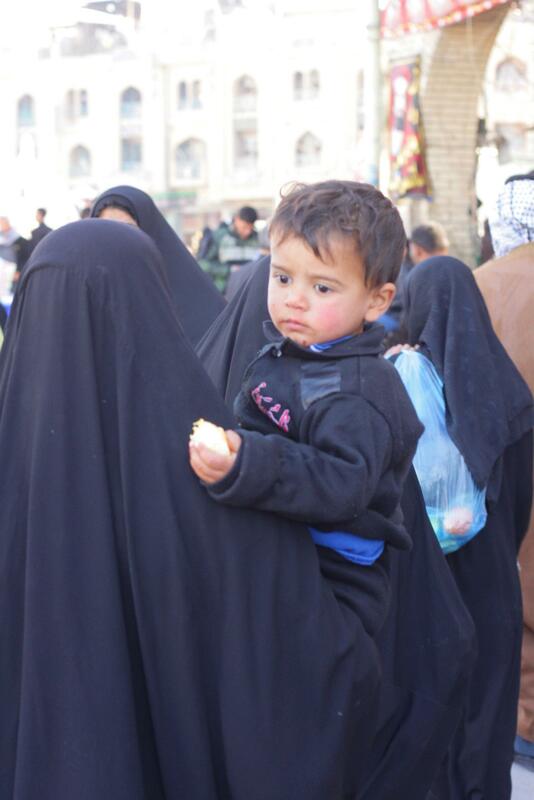 KARBALA IRAQ : An Iraqi burka clad mother holds her son who is suffering from an unknown illness. I still think a single file line would have sufficed. But there is something about the spirit that just does not allow for quiet submission. Years of being the minority, of being suppressed, this the one place that they all gravitate toward. We shared multiple stories about forcing our way to the zari. Just knowing that all of this was why people were here, and being witness to the extraordinary dedication and zeal over a faith. for the first time, we were not the minority.There was a high court judge from Malaysia, men, women and children from several states of India, Toronto, Dallas, Boston, Kuwait, Karachi, Iran—all here for one purpose. Some had flown, some had sat on a bus for up to 5 days, and many simply crossed borders on foot—just to get to this holy land. As we drove to Karbala from Najaf mid-week in the hot sun but in a fairly comfortable bus, we saw a trail of black-clad women trudging slowly on the dusty road. I rolled down the window and asked where they were walking from—Beirut. We were going to the same place. The same battle ground. Where it all began. 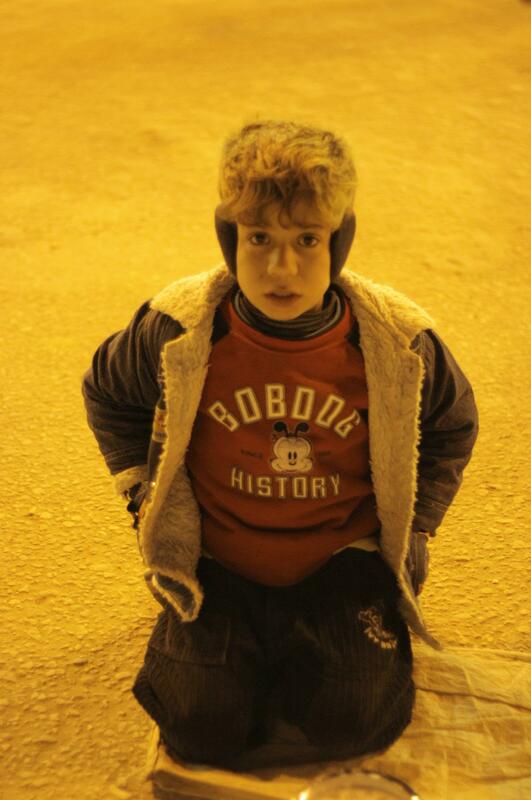 Pilgrims were sleeping on the road, in the night cold, wrapped in blankets in the courtyards just outside the mosques. We would be walking back to our compound in the early hours of the morning and there would be people shivering gently but singing chants and on their knees singing to keep warm, as if their spirituality was a shawl shielding them from the earthly cold. If there ever was a testimony to the power of faith—it is visible there.I have been to Mecca, but I think there might be something to the very function of being a minority, that this place is just for us that might have merit to the overwhelming sense of solidarity that I found in both Karbala and Najaf. Everything was centralized towards prayer, towards mourning, towards blessing. 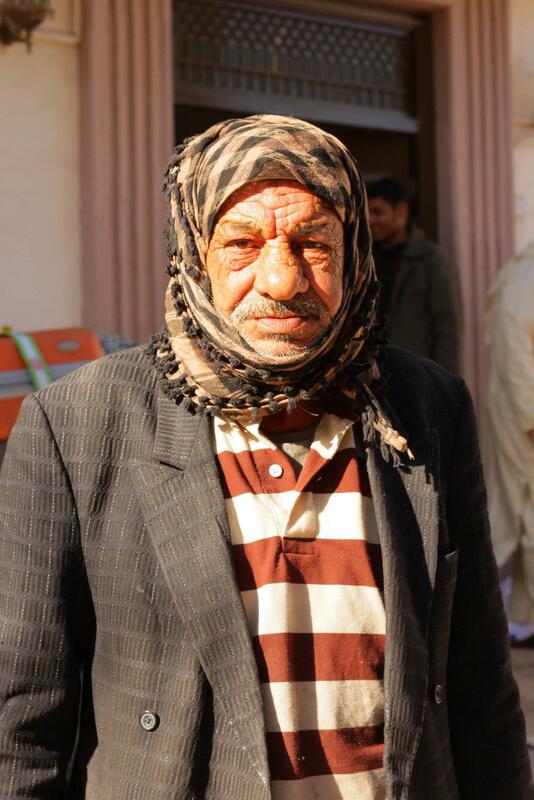 NAJAF IRAQ : An elderly Iraqi man has seen Muharram under three different regimes. Under Saddam Hussain Muharram practices were greatly suppressed and Shia prevented from visiting their holy shrines. In the morning of our departure from Najaf back to America, our group was gathered next to a group from Lebanon whom we had shared the two-hour long wait in customs upon our arrival and had seen numerous times throughout the week. As our sheikh finished his recitation of the ritual passage from the Quran regarding departure from the Holy Place, the Lebanese group leader rose, smiled at us, and began reciting the same verse. Hearing that overlap—hearing and feeling the universality first-hand brought a smile to my face. We often underestimate the significance of having something in common. NAJAF IRAQ : Is home the the Shrine of Imam Ali (first Shia Imam). 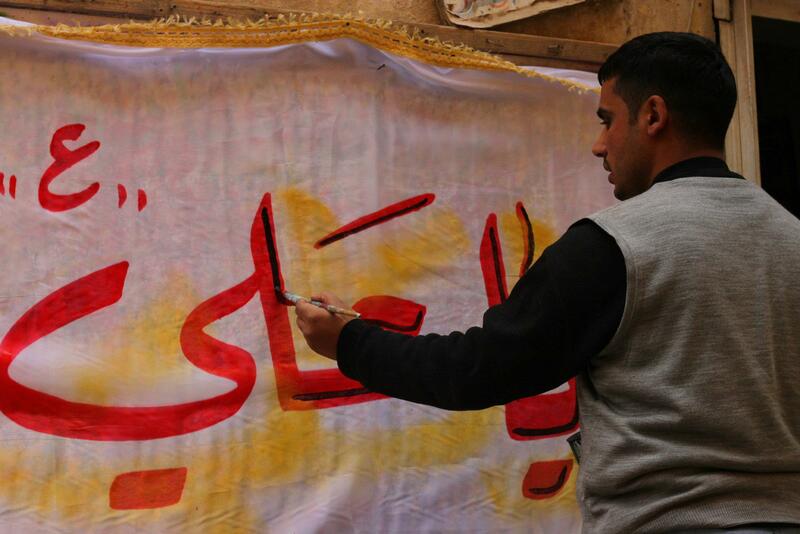 This Iraqi artist prepares a “Ya Ali” (Oh Ali!) banner for Muharram . Zahra Bhaiwala is a Masters of Science Candidate in International Health Economics at the Harvard School of Public Health. She graduated from Columbia University where she majored in Biological Sciences and Middle Eastern studies. All photos included in this essay were taken by the Author. Beautiful article, made me yearn to visit these places. The author had managed to capture the spirit of the cities so well. The photographs are brilliant. Beautiful and thought provoking article. If only one could apply the essay theme and look past our differences and focus on the meaning and purpose of our being and spirit, the world would be a better place. Beautiful capture of the spirit that prevails in these Holy cities. In the midst of violence there is still Faith, and Hope for Peace. Great shots that clarified the descriptions. You’ve ended my four day long hunt! Godd Bess you man. Have a nice day. The Author is also the Photographer.